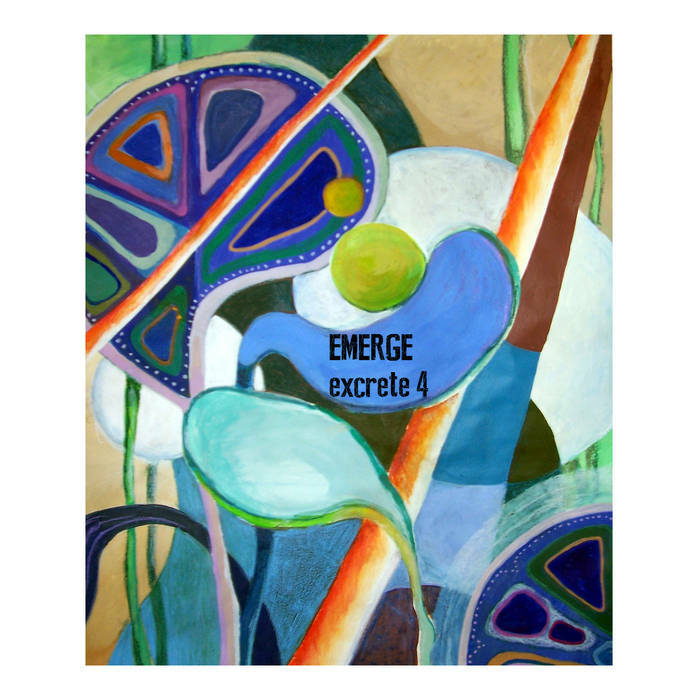 “Excrete 4” is the fourth in a series of five long-form pieces by EMERGE, each released as a cassette in its own right. Each about 55 minutes long, the subdued, minimalist approach of the pieces and their extremely long duration when listened to in their entirety, feels like an attempt to translate the specific temporal and experiential quality of Morton Feldman’s music, or of some sound installations, into the idiom of electroacoustic music. “Excrete 4” is deeper, darker, and more reverberated than the preceding parts of the cycle. Its cavernous sounds are closer to earlier work by EMERGE than the rest of the series, but the resonant spaces created by the sounds are all the more effectively contrasted with the long silences. This seems to be completely unhurried music, but the frequent breaks in musical communications, with the sound dropping out altogether, nevertheless create a peculiar sense of urgency and suspense: What will happen after the sound, which has been going on for so long now, has stopped?